OCNA Blog: On the surface, you met 16% of your Indiegogo campaign goal (about $4,000). But from what we’ve heard, the publicity from the campaign attracted a donor who didn’t want to donate through indiegogo, as well as some other investors? Were you able to meet the total stated goal? OCNA Blog: Apparently the actors cast in the Primary role of Erica, and the important supporting role of Ryan had conflicts, and the parts had to be recast? Chris: Conflicts arise and happen all of the time, especially in this business! Ryan was a particularly difficult character to cast because there needs to be a certain chemistry between Erica and Ryan. Not necessarily romantic chemistry but there has to be something intriguing about the way they relate. You don’t just cast characters, you cast relationships! Luckily Ansley Gordon came to our auditions and it was one of those situations where she blew us away. We had other fantastic actors come through but Ansley was an easy choice. When I showed my wife audition tapes she looked me and said, “She’s Erica.” I agreed! We got lucky again because Ansley is friends with another actor Matt Mercurio. 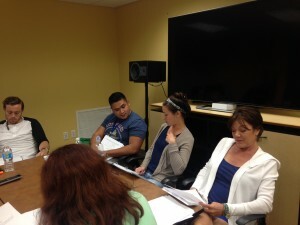 Instead of a regular audition we held a table read and invited him to read the role of Ryan. All I can say is “wow!”. They guy has a great aura to him, I love the way he speaks, and he’s different from how this role might traditionally be cast, which is exciting to me. The fact that he and Ansley already work together brings a connection into the film that I think will play out nicely! Altogether we have a great cast. I mean we’ve found the perfect actors for the roles and I couldn’t be happier. I can’t wait to work with them on set! OCNA Blog: When is primary shooting scheduled to take place? Are all the locations and necessary permits in place? Chris: We begin principle photography in July and it will go through the beginning of August. We’ve got all of our locations locked down and we’ve requested permits from Brevard County. Right now we’re working on getting a permit for this beautiful field in a state park for the scene where they launch a model rocket. Hopefully that works out but they want to charge us some serious coin so I’m not sure if it’ll work out. But hey one can hope! If not there are plenty of beautiful fields in this world. I’m sure we’ll find the perfect one. OCNA Blog: So the Treasure the Movie Pathtags and Geocoins have been received from the manufacturers, and perk fulfillment for donors can begin? Chris: Yes! 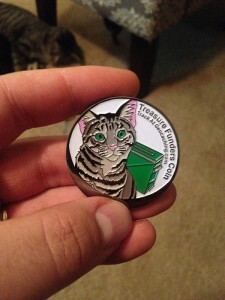 We’ve received the Geocoins, Pathtags, and TravelFleas and have tested our shipping method and will be mailing them out this week. These items look GREAT. We love them and my cat Jazzy the Geocat is excited about them too because she’s featured on the Geocoins and Pathtags.I’m really excited because our contributors will receive their swag and then they’ll receive frequent updates about the filmmaking process during production. It’s going to be a great summer for all involved. OCNA Blog: Per the email update to the Treasure mailing list, we didn’t realize the importance of feeding the cast and crew during 12-14 hour days, and that it was the biggest item in the budget! Chris: Yeah that’s a biggie. Think of it this way: 20 days of shooting is basically like planning 20 small weddings. And there are a lot of little jobs to do so there’s anywhere from 14-30 people involved everyday. We have to have around 400 meals catered during this production. It’s the most expensive thing in the budget but absolutely necessary to keep the gears turning. The reason to do catering and not cook food ourselves is that the last thing I want to do is distract my crew from the creativity of the film. We need the food to be there on time everyday ready to go so that it’s not a constant worry. And I can tell you this, I’ve worked on a lot of productions. I’ll forget a lot of details but one thing I don’t forget is how I was treated by the producers. I’ve been on really badly produced sets where the producers don’t have their act together but they fed us well and that smoothed things over. When they take care of you it creates an amazing experience that you don’t soon forget. Early on I told my producer that we were going to treat our cast and crew with utmost respect by having our act together by putting in the time to plan everything properly and treating them well. It’s the least we can do! OCNA Blog: You moved filming back a little from what was stated during the Indiegogo campaign. Does the post production schedule remain the same, including you needing a “fine cut” of the film to graduate in the Spring of 2015? Chris: Yes we moved everything back about six weeks which is fantastic because we’ve been able to do workflow tests, extra auditions, and get into even more of the details of planning. Our post-production schedule hasn’t changed a bit. I have to have a fine cut of the film by next spring. I’d like to have picture locked by then so we can work on sound design. Most people don’t know it but sound design is an extremely important part of the experience of any film. Like I tell my students, “Sound is half the movie!”. I imagine I’ll have a complete film by fall or winter of 2015, just in time for the 2016 film festival season. We will use film festivals as a theatrical run. 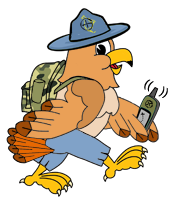 Any festival Treasure plays we’ll alert all geocachers in the area that they can go see it. Then we release it to the world for all to enjoy. Making a film is a long process but it is finite. It’s a journey for sure and like most journey’s it will have an end. And like most geocachers know…the fun is in the journey! Thanks so much Chris, for taking the time to answer more questions! We’re sure we’ll be hearing from him again in the future regarding Treasure the film!